Experiments with Bleach…… | In the Crayon Patch.. 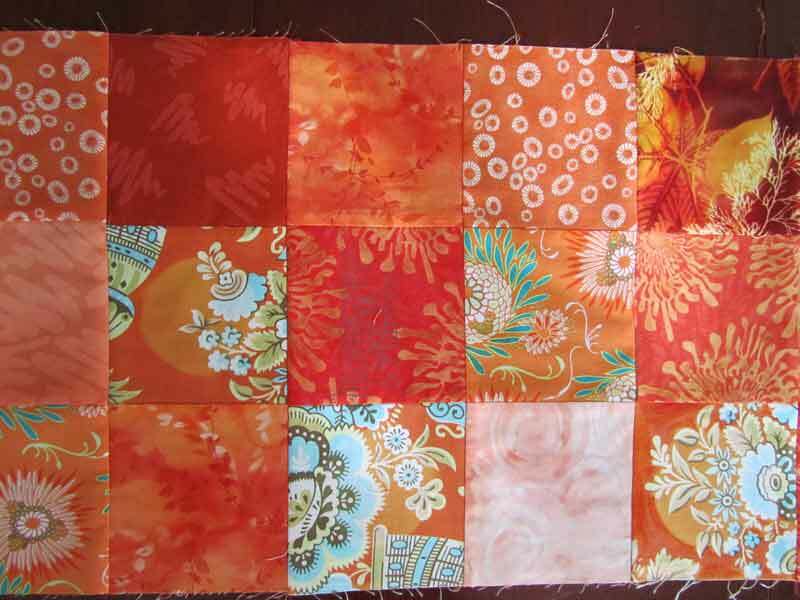 I saw a wonderful quilt in Quilting Arts magazine that used plastic templates for dye resist. The artist was Malka Dubrawsky, who has instructions for this technique available online. She has examples of this on her blog here. I’ve been lusting after the templates to try this ever since. I recently found the templates for sale on Etsey here, so I rushed out and bought them. I didn’t have all the supplies I needed for dying, so decided to try using bleach to obtain the colour variations I lusted after. The starting fabric for this is an Amy Butler fabric from a few years ago. I love the design but the orange was a bit darker than I wanted. Here are the results of my first experiment….. Here are some of the blocks created with this technique… top row blocks were made with the circle template (remains unbleached), and bottom row blocks were made with the square template, so the circle was the area bleached. The second batch I tried had a lot of leakage (see block F)- not sure why, as I used the same clamps and felt I set up the same way. Still, it gave an interesting pattern, and I used it in my final piecing. Click on the photos for a closer look. I tried other fabrics, but most of them did not bleach well. 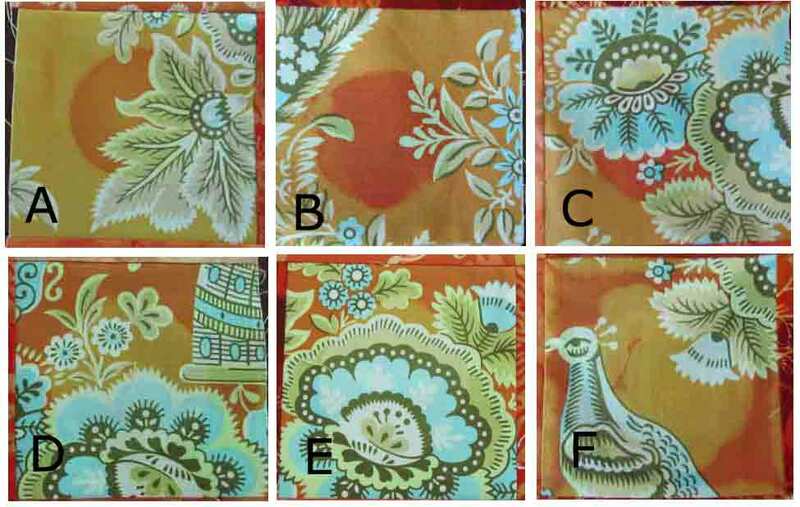 Here are some examples of other blocks that did bleach somewhat- top row unbleached, bottom row bleached. 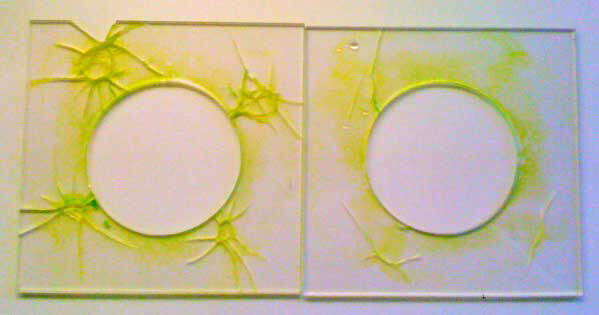 In sample B the centre circle area was bleached, blocks D & F were totally immersed in bleach. 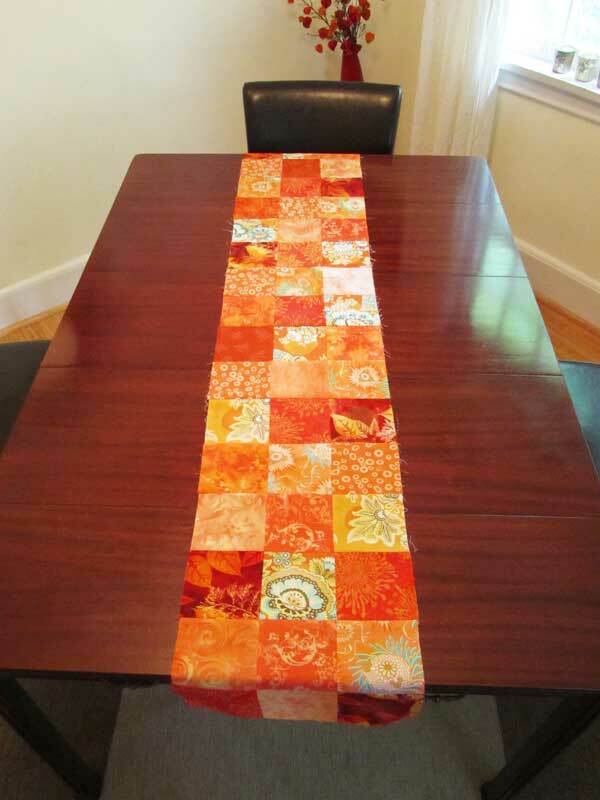 Here are photos of some pieced blocks, and the final pieced work, a table runner I created with the blocks I made in this project. 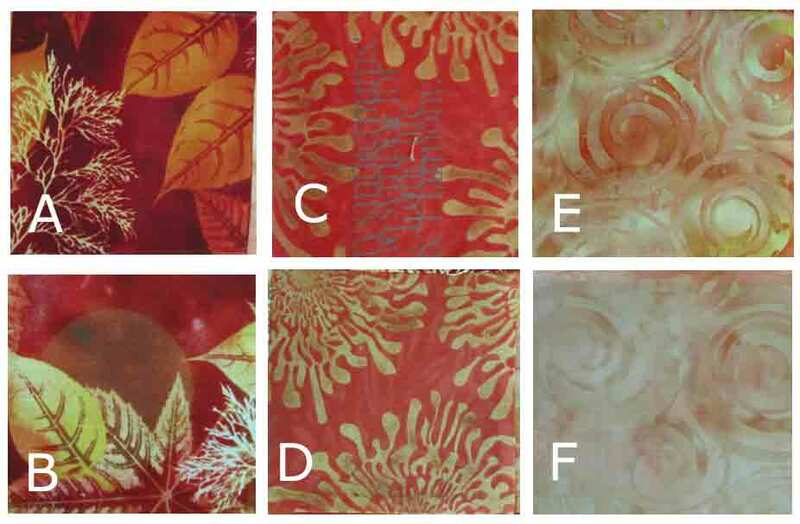 The fabrics that are used in the final project include the fabrics I tried (unsuccessfully) to bleach as well as all those shown above. This item is now for sale on Etsey. P.S. I decided to use the templates with some spray dye that I had on hand- it was alcohol-based, and ruined the plastic. You can see where the clamps were….. I guess this is another lesson learned- no alcohol based chemicals near plastic!